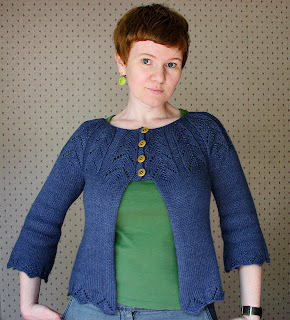 The Woolly Brew: new shop sample - Fiona's new cardigan! new shop sample - Fiona's new cardigan! The pattern is the Moch cardigan designed by Gudrun Johnston, one of our new patterns in the shop. It was knitted in Lousia Harding Ianthe, a DK weight yarn. I used shade 18. It was a very quick knit and my first grown up bottom up cardigan. You knit the body in once piece - slipping the first stitch in every row. You then knit both sleeves and put the whole lot onto a long circular needle to knit the lace patterned yoke. You graft the under arms together at the end. Following the designers advice I choose a size a couple of inches smaller than me, but I was still a wee bit worried that the cardigan would be too big. However once the yoke was done and I had cast off on smaller needles the yoke was pulled in very nicely! The Louisa Harding Ianthe yarn was lovely to work with. It didn't split and has lovely stitch definition. It was soft and smooth on my hands. I added an 2 extra rows at the neckline to make it higher. The cardigan is currently in the window on our Dummy but I'm not sure for how long as I really want to wear it! Also the Dummy is a size 10 and I'm not! So it looks a wee bit big... It is actually a much closer fitting cardigan. There was some discussion about giving her some balls of wool for breasts or fashioning some bosoms from bubble wrap but she has been left with her A - cups! 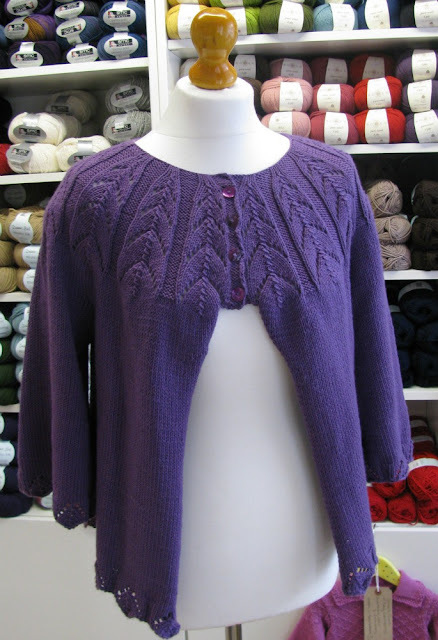 Moch Cardigan pattern in 10 sizes, charted and written instructions. £4.75.